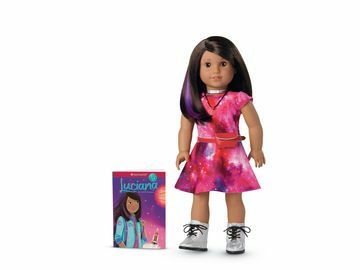 Say Aloha To American Girl's Newest Historical Character, Nanea Mitchell | Mattel Inc.
MIDDLETON, Wis., Aug. 21, 2017 -- Today, girls everywhere will say "Aloha!" to American Girl's newest BeForever character, Nanea Mitchell, a Hawaiian girl growing up on the island of Oahu in 1941. Nanea's story explores what life was like for islanders in the weeks leading up to and the aftermath of the attack on Pearl Harbor on December 7, 1941, and the U.S.'s entry into World War Two. In bringing this significant period in history to life for girls today, Nanea's story illuminates how the courage, patriotism, and aloha spirit of the Hawaiian people inspired a nation at war and shows how one girl can make a meaningful difference in the face of big change. "At its heart, our BeForever line is about building a bridge of understanding, helping girls today see the interconnectedness—the feelings, experiences, hopes, and dreams—that exists between themselves and girls from long ago," says Katy Dickson, president of American Girl. "We hope Nanea's powerful story of resilience, responsibility to others, and contributing for the common good—or kokua, as it's known in Hawaii—will resonate with girls and show them they have the power within to face the obstacles that come their way." Written by Newbery Honor Award-winning author Kirby Larson, the Nanea series introduces readers to 9-year-old Nanea Mitchell. Nanea loves her close-knit extended family, dancing the hula, fishing with her father, and playing with her dog, Mele. Nanea is also eager to "dip her paddle in" to be useful at home and at her grandparents' store. When Pearl Harbor—the naval base where her father works—is attacked by Japan, the peaceful existence the Mitchells and their neighbors enjoy is replaced with martial law, and rumors of additional attacks and frequent air-raid drills have everyone on edge. Amid the chaos and uncertainty, Nanea embraces her spirit of aloha and deeply held belief in kokua—doing good deeds and giving selflessly—to do her part for the war effort and help restore peace to her beloved Hawaiian home. In addition to the stories, the Nanea collection features a beautiful 18-inch doll featuring an all-new face mold, hazel eyes, and dark brown hair, plus several 1940s-era, Hawaiian-inspired doll outfits and Nanea-inspired apparel for girls. Numerous authentic-to-the-era accessories round out the play experience, including Nanea's Hula Outfit and Hula Implements and Nanea's Family Market, with 90 pieces, including a wooden store with a movable counter, food, supplies, displays, and more. To help ensure the historical accuracy and cultural authenticity of Nanea's story and products, American Girl worked closely with a five-member advisory board who provided their expertise in Hawaiian culture, language, and history to inform all aspects of Nanea's development—including the doll, books, outfits, and accessories. To support Nanea's inspiring message, from August 21 until the end of 2017, American Girl will be collecting donations for the American Red Cross Service to the Armed Forces (SAF) program to help provide comfort and care to the members of the military, veterans, and their families. American Girl will match every dollar donation made at americangirl.com or at any American Girl store in the U.S. up to a maximum total donation of $75,000. 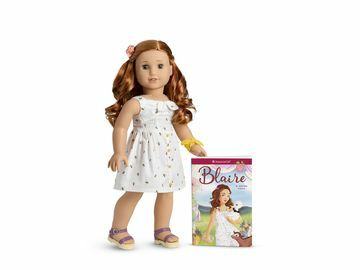 American Girl is also giving $575,000 worth of its signature 18-inch dolls to the American Red Cross to provide a bit of cheer to children in times of crisis. Nanea Island Inspiration Sweepstakes: American Girl has partnered with Visit Oahu on a sweepstakes for the chance to win a fun-filled family getaway for four to Oahu, which includes round-trip travel on Hawaiian Airlines, a four-night stay at The Royal Hawaiian, tickets for four to the Aha Aina Luau Show, a visit to two attractions at Pearl Harbor, and a Nanea doll. 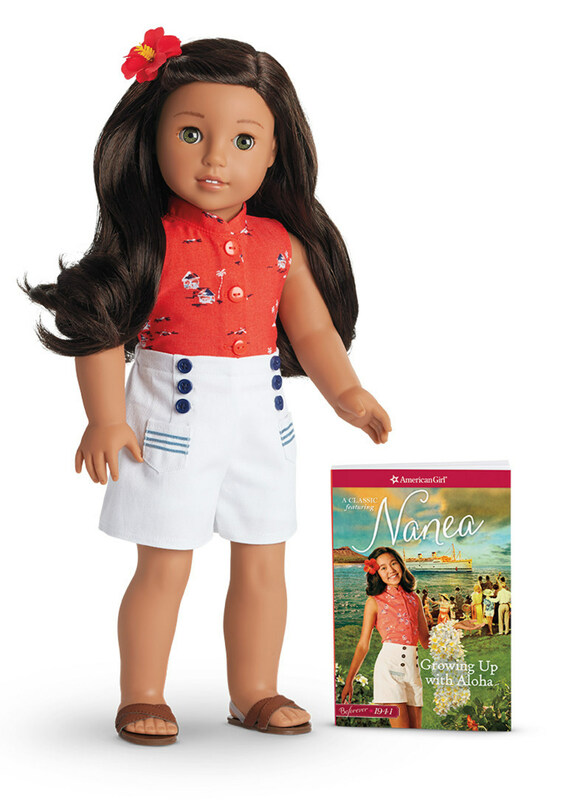 Nanea Retail Events: On August 25 and 26, American Girl's retail stores are hosting special debut events to introduce girls to Nanea's world in 1941 Hawaii. Girls will enjoy a hula demonstration, a fun free craft, a doll drawstring bag giveaway, and a chance to win a Nanea doll. Nanea-themed events will also be held at the American Girl stores throughout the year. Nanea Videos and Online Play: Behind-the-scenes videos on Nanea's story and development, along with fun Hawaiian-themed craft and activity videos, are available on American Girl's YouTube channel at YouTube.com/americangirl. Girls can also visit the Nanea-dedicated site at americangirl.com/PlayNanea for book excerpts, games and quizzes, wallpaper, and much more. Nanea Learning Materials: A free, downloadable teacher's guide, which explores themes and issues covered in the Nanea book series, is available at americangirl.com/corporate/parents-and-teachers. The Nanea product collection will be available on August 21, 2017, at americangirl.com; through American Girl's catalogue; at americangirl.com; at all American Girl retail locations nationwide; at American Girl specialty boutiques at select Indigo™ and Chapters™ in Canada and El Palacio de Hierro locations in Mexico City. The Nanea books can also be purchased through retail and online booksellers. To learn more about Nanea and the BeForever line of historical characters, go to americangirl.com or visit American Girl's social channels. To request a free American Girl catalogue, call 1-800-845-0005; to join the company's new loyalty program, AG Rewards, go to americangirl.com/REWARDS. The American Red Cross shelters, feeds and provides emotional support to victims of disasters; supplies about 40 percent of the nation's blood; teaches skills that save lives; provides international humanitarian aid; and supports military members and their families. The Red Cross is a not-for-profit organization that depends on volunteers and the generosity of the American public to perform its mission. For more information, please visit redcross.org or cruzrojaamericana.org, or visit us on Twitter at @RedCross. The Red Cross emblem is a protected symbol designated for use by the United States armed forces and the American Red Cross under federal statute 18 USC §706. American Girl's newest BeForever character, Nanea Mitchell, a Hawaiian girl growing on the island of Oahu in 1941.